Almost everyone who has been involved with or studied Utah’s oil and gas industry lately knows that the trend in exploration and development over the past few years has been toward natural gas. What is not generally known is the degree to which natural gas drilling has dominated the industry in Utah since 1991, the first year that gas well completions exceeded oil well completions, and that the focus today is almost totally on natural gas. Until the natural gas market was deregulated in 1976, gas occurrences were mostly regarded as an impediment to oil production, and, other than local or regional gas companies, there were few explorers and even fewer outlets for natural gas production. That situation has changed dramatically over the ensuing 27 years. According to the Utah Division of Oil, Gas and Mining, Utah fields produced 77.1 billion cubic feet (BCF) of gas in 1976, compared to 293 BCF in 2002, an almost four-fold increase. On the other hand, oil production in 1976 was 35.4 million barrels, peaked in 1985 at 41.1 million barrels, and has steadily declined ever since. Oil production in 2002 was about 13.7 million barrels, and at the current rate of decline will be below 10 million barrels by 2010. At the end of 2002, about 2,640 oil wells and 3,538 gas wells were producing or capable of production. This is nearly half of the oil and gas wells that have been drilled since the completion of Utah’s first commercial oil well in 1948. A look at drilling activity over the past five years (see data chart) provides further evidence of the relative dominance of the natural gas industry in Utah. Applications for a Permit to Drill (APD) varied from a low of 339 in 1999 to an all-time high of 880 in 2001, and averaged 635 permits per year. Four hundred permits were issued in the first six months of 2003, indicating a higher than average year. During this five-year period, 1,668 wells were completed as natural gas wells compared to 410 that were completed as oil wells. Oil well completions have fallen from 159 wells in 1998 to 43 wells in 2002. A look at the type of successful wildcat wells is just as telling, as successful wildcats almost always result in new sources for production. For the period 1998 through 2002, only eight wildcat oil wells were successfully completed, compared to 71 successful wildcat gas wells. One reason for the increase in gas activity and decrease in oil is that, until recently, oil prices have been depressed whereas natural gas prices have increased substantially over the past eight years. 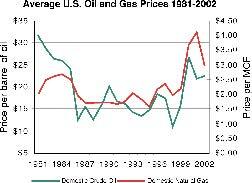 The graph below shows the range of average domestic oil and gas prices from 1981 through 2002. After peaking at nearly $32 per barrel in 1981, oil prices dropped sharply in 1986, and generally remained in the range of about $12 to $19 per barrel until 1999. In Utah, crude oil prices rose from $12.52 per barrel in 1998 to the current (June 2003) price of $30.66 per barrel, but have only been above $20 per barrel since 2000. The long period of sustained low prices led not only to a stagnation of drilling activity, but also to a hastened decline in oil production as marginally economic wells were shut-in and oil recovery technologies were not utilized. Other reasons for the surge in natural gas development include the availability of land that is more favorable for gas than oil. The increased demand for natural gas in industrial applications is also an important factor in the recent surge in prices. The fact that Utah’s major oil provinces (Thrust Belt, Uinta Basin, and Paradox Basin) are mature is also a factor in the decline of oil exploration. In contrast to oil prices, domestic wellhead natural gas prices bottomed out at $1.55 per MCF in 1995 and have increased substantially since then, reaching a high of $4.12 per MCF in 2001. Utah wellhead natural gas prices, which have been lower than the national average due to infrastructure constraints, have risen similarly from $1.73 per MCF in 1998 to $3.52 per MCF in 2001. The average Utah wellhead price is not available for 2002, but spot prices (daily market prices) indicate that the average will be about $3 per MCF in 2002, and spot prices for 2003 are currently above $5 per MCF. The infrastructure to move gas from the field to the marketplace is still lacking, especially in the Rocky Mountain region, but progress is being made. An example of this is the recently expanded Kern River gas transmission line that carries gas from Wyoming and Utah to markets in Nevada and California. The $1.2 billion expansion, completed in May 2003, added 717 miles of pipeline and doubled the line’s capacity to 1.7 BCF per day. This expansion has already reduced the price differential between Utah producers and the rest of the country. The switch to natural gas development in Utah is typical of other oil and gas producing states, as nationwide the long-term trend is less oil production and more natural gas production. Utah has many areas that remain to be explored for both oil and gas, but the present trend is definitely toward natural gas. Additional statistical and individual well data are available on the Utah Division of Oil, Gas and Mining’s web site at . Nationwide oil and gas production and market data can be found on the Energy Information Administration’s web site at .